Delicious freshly baked or toasted with a little butter – the perfect way to start your day. Measure the ingredients into the pan in the order they are listed above excluding the cherries or cranberries, nuts and dried apple at this stage. This ensures the best mixing and therefore the best result. Select large loaf size by pressing the loaf size button and then press the start button. 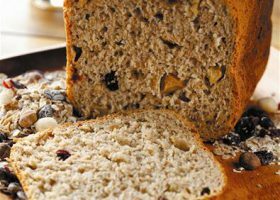 *If you wish to make the muesli loaf with the time facility, add the dried fruit and nuts with the other ingredients, adding them last.